A luck angler pulls in his catch of the day from a cold mountain stream on this scenic coat rack. 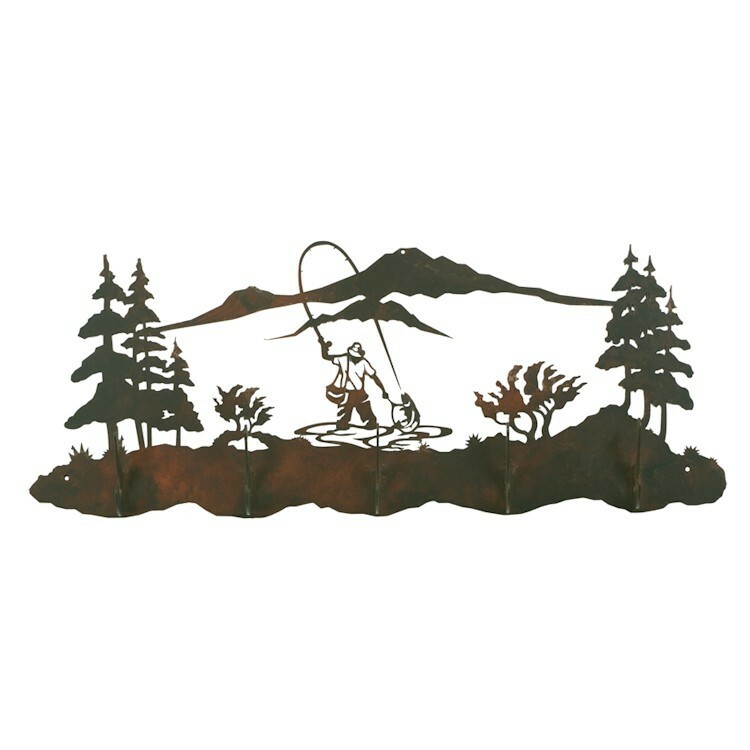 Made from heavy metal our Fly Fishing Scenic Coat Rack is available in two designer finishes and features 5 sturdy hooks. Rust Patina - has a variation of color anywhere from dark rust brown to a small amount of orange rust coloring, it will vary from one piece to the next because of the hand crafted nature of the patina. © 2016 The Cabin Shop. All Rights Reserved. We guarantee the lowest price for this item and for 30 days after your purchase. If you find the exact item advertised for less we match that price plus 5% discount for that item. Obtaining the lowest price is easy. Sign-in to your account then complete this form and add the item to your cart. Guest submissions will be emailed a discount code.